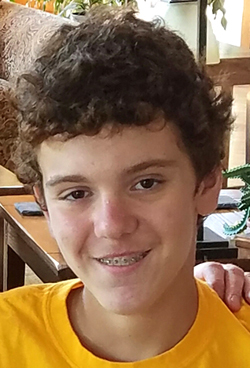 Aleksandr Paul Frank, 15, of Holly Springs, N.C., went to be with the Lord on Jan. 16, 2017, at the University of North Carolina Children’s Hospital, where he had been a patient during his short fight with cancer. He was born Nov. 30, 2001, in Lock Haven, the son of Oksana Alexandrovna (Frank) Fore and Jeffrey Ruhl Frank Jr.
Alek, although a quiet young man, brought joy to everyone he met with his infectious smile. While spending vacations with Pappy and Grammy Frank, he enjoyed: bicycling, kayaking on Pine Creek, mowing fields and making Caesar salad. Construction work with Pappy Jeff was a special joy to Alek. He loved Gram Seyler’s pet chicken, and all dogs and cats. He liked building fires at the cabin, splashing in the pool with his cousin, Ethan, eating dinner al fresco, and watching “Walking Dead.” Like most boys, he was drawn to anything with wheels: snowmobiles, back-hoes, motorcycles, dump trucks and cars. Back in N.C., he enjoyed video games, going to exhibits, attending concerts with his father and spending time with his friends. In Fla., he enjoyed helping his mother and stepfather at their office, working out at the gym, riding go-carts, and watching movies. The Fla. beaches, wildlife and historical sites fascinated him. Surviving, in addition to his parents are his stepfather, Justin Fore of Fla.; stepmother, Margarita Zenzura; grandparents, Christina Livingston Frank and Jeffrey Frank Sr., of Lock Haven, Leonard Stiver, of Punxsutawney, Donald and Anne Fore, of Fla., Theodore and Randi Hoffman, of Conn., Alexander Krylovsky, of Odessa, Ukraine; great-grandparents, Shirley and Frank Seyler, of Beech Creek and Carole and Tom Livingston, of Salona; great-great-grandparents, Louise Smith, of Lock Haven and Sara Moore, of Hublersburg; uncle, Brian and aunt, Natashia (Frank) Carter, of Trout Run and uncle, Kai Stiver, of Punxsutawney; special cousin, Ethan and his little brother, Paul Carter, of Trout Run; three stepsisters, Lily Zenzura, Samantha Fore and Danielle Fore; as well as numerous aunts, uncles and cousins. Alek was preceded in death by his grandmother, Karen (Seyler) Stiver; aunt, Sage Stiver; and grandmother, Natasha Krylovskaya. Memorial service arrangements will be announced at the convenience of the family.